In 2015 John Gilbert beat me and, in doing so, set a new course record for the Marathon Eryri, (Snowdonia Marathon). 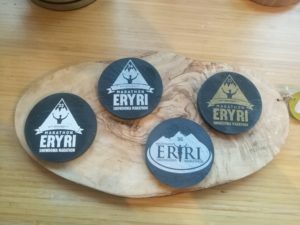 Eryri is often regarded as the toughest but one of the most popular road marathons in the UK, and was my first marathon after a little over a year’s running. The year after, after a successful pre-race psychological battle. (most, if not all of which, Gilbert was blissfully unaware of, such was its subtle brilliance), I scared Gilbert off and he feigned injury sending his Kent AC team mate Russell Bentley out instead to face me. Sadly, due to ill health (mine, not his), Bentley pipped me to the line by a little over 2 hours in 2016. Despite victory for Kent AC in the preceding years, Striders dominance prevailed and neither of the Southern softies attempted the battle in 2017. However; badly trained and badly prepared, I badly paced the race and slumped at the final hill, allowing some skinny Welsh bloke to sneak in and set a new course record. The previous years had shown me that, although I was a stronger runner in every respect than back then, that 2015 3:53 performance was no mean feat. I’d reflected a lot on the relative failure of 2017 and realised that in 2015, I had put together a singular program of great intensity, sustained by the progress and PBs it led to, as an improving new runner. Every session was attacked with determined (and naïve) enthusiasm, as was the race . In retrospect, I was probably lucky not to get injured that year. 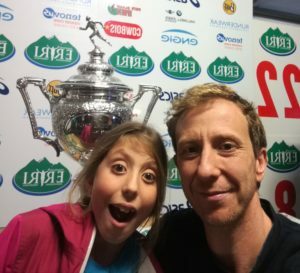 In 2018 I was no better, if not less, well trained than 2017; the peak training of the Snowdonia Trail Marathon in the summer had again proved impossible to maintain over the school holidays along with the psychophysical lacuna that often follows a big race. As such I really didn’t pick up again till about 6 weeks out. What I did try to harness in those remaining sessions, was that dogged determination to push beyond that point where you want to stop, driving down the rising fear and just pushing on. Key training weekly runs included a fast 4-5mile technical route around Burbage, a mile interval session and a long hilly off road run. Notable by its absence were the Cobnar sessions that were the key element in 2015. C was vanishingly unlikely with the lack of peak, race-specific training. A day out, I wrote an optimistic 3:52 pace plan, with a goal of being around or slower at each stage to conserve for the final hill at Waunfaur village. Pacing is hard at Eryri; the change in gradient is varied and severe and a constant effort pace may vary from 7:00 to 13:00 min miles for a 4 hour runner. For someone as cataclysmically bad at pacing as me, it’s even harder. 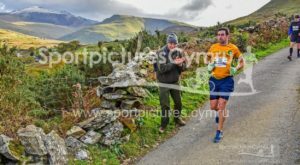 On the morning of the race it was about 6° C for Bentley and I and the 2500 ‘also rans’ who approached the start, with a faint dusting of snow visible on the Glydrs, Carneddau and Snowdon range. As is my habit, I’d hovered back a bit making regular use of the VIP race line loos, (bushes and trees near the start) and I’d gone prepared with a black bin bag for warmth. Bentley had naively not taken advantage of any of this and stood shivering at the front on the start line. Without much of the distraction of a city marathon; no B list local celebs droning on about some sh#t or some hysterical gym bunny screeching in to radio mike, as she bobs up and down in an utterly irrelevant but bladder-jerking warm up, the race’s only sacrifice to pageant was a 10 second countdown and then we were off. The race leaves Llanberis, along the road through Nant Peris, slightly climbing for a mile and then climbs solidly though the Llanberis Pass to the Pen y Pas Youth Hostel at the start of the PYG track to the Snowdon summit. From Nant Peris I am at home and the world is a beautiful and wondrous place without fear or anxiety of my everyday life; only mountains and running. Unfortunately, although a thing of wonder, it is also about 900ft of climb in about 3.5 miles but the wonder and the race vibe make it hard not to go too fast. I caught up with Strider Matt Gibson after a mile or so and exchanged morning pleasantries. Gibson, a master of steady pacing, would have perhaps been worth sticking with for longer but unfortunately our plan of him using a ‘wide berth’ technique at the front to run interference for me and slow Bentley had failed, as Bentley had naively set off at an impossible pace and led the second place bloke by 90 seconds at Pen Y Pas, (I was a little further back ‘conserving’). What follows is a matching decent down to Nant Gwynant, and sweet Jesus, the world is even more effing brilliant as the tarmac gives way to trail for a couple of miles, and despite my best efforts at keeping it steady, clocked a couple of sub 7 min miles. The track gives way to tarmac again at Llyn Gwynant with a short sharp hill, and an undulating few miles to the half way at Beddgelert town. I managed some restraint here, reminding myself that much as I wanted this less interesting period to be over, every steadier mile was energy in the bank for the last hill and made the half only a little faster than goal pace at 1:49. Bentley had no such self control and passed halfway, somewhat earlier, 3 minutes ahead of second place. After the supportive crowds of Beddgelert, comes a bleak 2 mile 500ft plus climb who’s only redeeming feature is that it mentally prepares you for the systematic destruction of your self and soul that is the following “undulating” Rhyd Ddu section. “Lies, its all lies” Welsh Lady 2018. The 5.5 mile Rhyd Ddu section from mile 16 is not a “gently undulating descent” it is a place where dreams and hopes and thighs go to die. Miles 16 to 21.5 are rarely favourites for marathon runners, but having already run that much ascent with the scenery dropping away with each mile, two way traffic with you and a more spread out field, each uphill seems impossible on tired legs and the downhills give little recovery to a body that really would quite like you to, “just stop effing running please” and really does not give two sh#ts about whether that running is up or down. At times I thought I would give way to cramp, exhaustion, digestive issues or a messy and embarrassing combination of all three. There was also a head wind. As it happens around this point young Bentley, (and am not gonna be the one to say “course cutting?”, but still….?) finished the race in 2:38:21, at an average of just over 6 min miles. None the less with only goal A now left in mind; of just somehow conserving, (this did not feel like conserving…), I slowed but kept going. I’d been sipping my Tailwind and water combination at each mile and supplementing with water at aid stations and realised I was actually in adequate shape in terms of hydration and fuelling and the cold air temperature prevented overheating of which I am prone. What remained was head stuff and pain. As such I was increasingly and perversely looking forward to the hill as it would at least mean an end to this period in my life one way or another. As I approached Waunfawr at mile 21.5, 4 hours was possible if I could do what at that point seemed impossible and channel Kate Bush for 2 miles and 900ft of climb. The hills starts steep as you enter the outskirts of the village, you then turn right and you redefine your definition of “steep”. However, with caffeine gel pick me up and fresh water at around 19, I was still moving. Hurt in a generalised full body, heart, lung, legs, head sense, but also with occasional more specific bouts of knee and hip pain. It was however I realised after half a mile, not getting any worse. 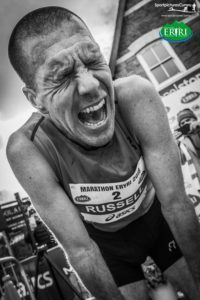 I had however re read the chapter ‘The Legend of Iron Joss’ from ‘Feet in Clouds’ the night before and was reminded how relative pain was… So with the beautiful otherworldly warbling of Kate and slightest of upward twitches of a wild and wiry Cumbrian eyebrow that would equate to vociferous Joss cheerleading, I kept running. Gradually less and less people were running till I was the only one running. It hurt but this was already goal A achieved. I saw Parc Bryn Bach lady walking ahead and set her as a goal, then the feed station past the edge of the village and only then let myself walk for a hundred metres or so. By this point I really felt I was pushing all the internal dials into the red zone but felt mentally strong, but as the miles / minutes to go arithmetic became more calculable, I realised that goal B and a sub 4 hour was possible, if I kept up the pace for the further mile of false summits after the main climb, which of course instantly threw me into self doubt and a wobble and I actually had another walk with the summit in sight. The top came and I recalled my 3 mile fast finish down the Llanberis Path of earlier in the year at the Trail Marathon and so just utterly went for the shorter 1.5 mile descent of this race, the first mile of which is full off road (on tired legs and road shoes….). Burbage trained tootsies took care of everything and I lent into it passing many other runners and smashed back into Llanberis at 6:30 pace feeling great. Yes, Bentley had won again, but I’d come in only a minute off my PB in 3:54:22, and closed the gap between us by 2 minutes and so laid the foundations for his ultimate destruction in 2019. Gibson sashayed round to a PB in 4:13:13 but such was his disappointment in not holding Bentley up in those vital early miles, as planned, (that would, FFS, have obviously made all the difference…); punished himself by completing the Paul Stuart double and running the Worksop Half the day after. The women’s race was far more interesting than mine and Bentley’s, not least owing to the surnames involved; with Emma Bracegirdle, in only her second marathon, gradually reeling in the leaders mile after mile and only hitting the lead near the last descent; finishing 2 minutes ahead of Emma Wookey who’d led for 24 miles, in 3:06:02. Strider Emma Williams finished a tactical distance behind Bracegirdle and Wookey at 4.35.29 with the highest category position of a Strider on the day. She’s laid a solid base for 2019 hanging back to not alert Bracegirdle, just perhaps needs to invest in a new surname to gain that extra marginal gain, pethaps “Emma Skywalker” or “Emma Noodlebangle” would be my suggestions. Entries for 2019 open 07:00 on December 1st and it will sell out in minutes. Would definitely recommend, if only for the slate coaster and personal development opportunities. Cobnar Club will also be reopening in November on a Tuesday evening.